Linda's neighborhood is high on a hill at 1500' elevation where the terrain is even rockier than mine which is 500' lower and just minutes away . Resisting the urge to plant every inch, Linda mulched the rounded center space. Guests are greeted by a table of succulents. A single sculptural Anacacho Orchid holds court in a narrow raised bed. 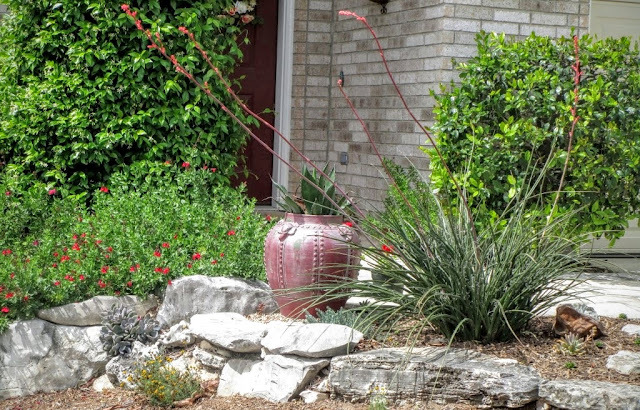 Three Agave leguchilla accent the front corner. Jasmine clambers up the front column. A crevice garden for succulents anchors the driveway corner. 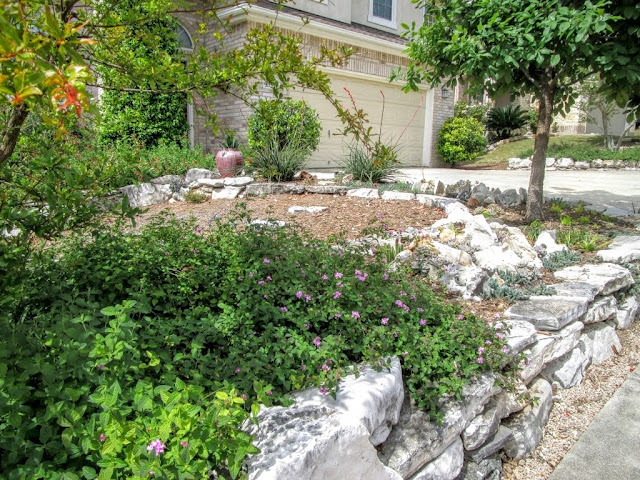 Linda's skilled placement of stones and plants is on full display. 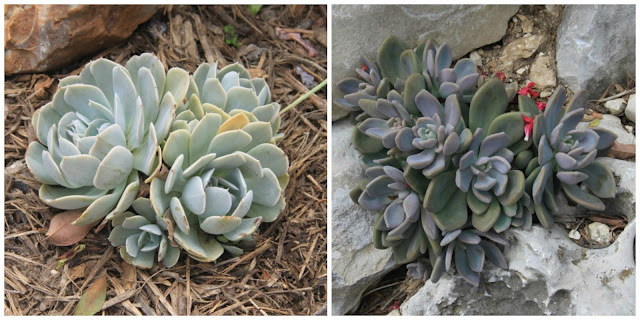 Succulents are still filling in this fairly recent installation. 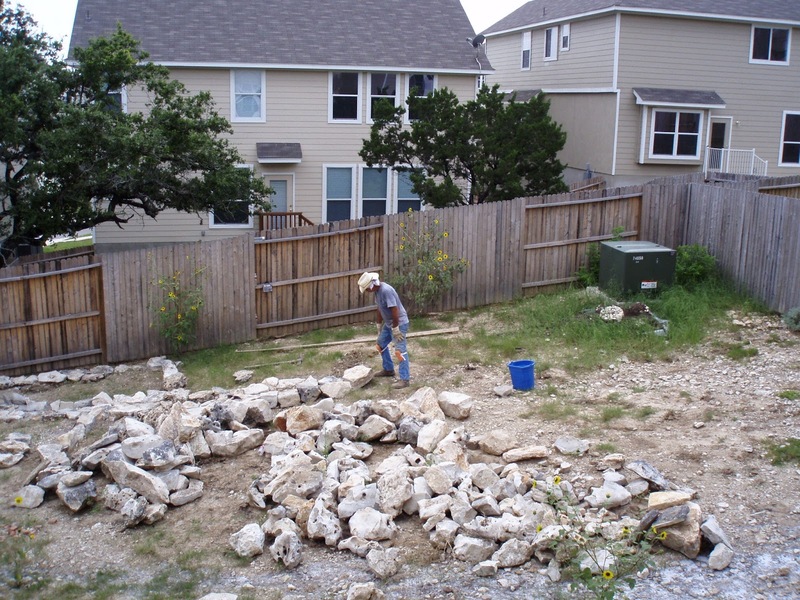 Large corner rocks were moved in place by a skid steer while most of the other rocks were collected on site and placed by Linda and Alan. 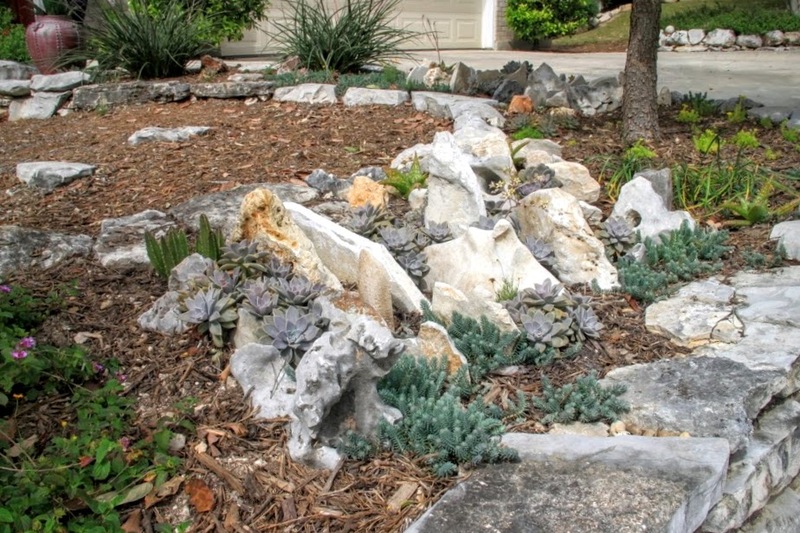 Bluebonnets naturally find their way into small gravel spaces. 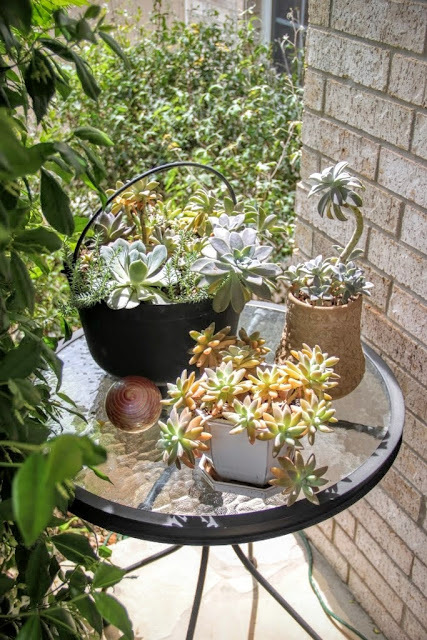 Prickly Agarita, a native berry bush, makes a great burglar deterrent against the front windows. 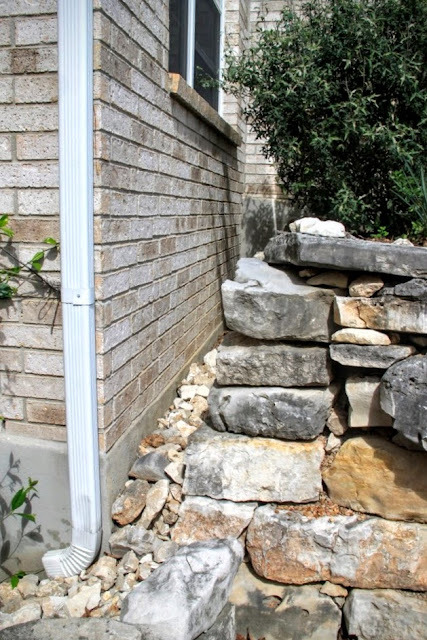 This channel below the windows keeps garden soil off the brick. Cool details among the rocks. 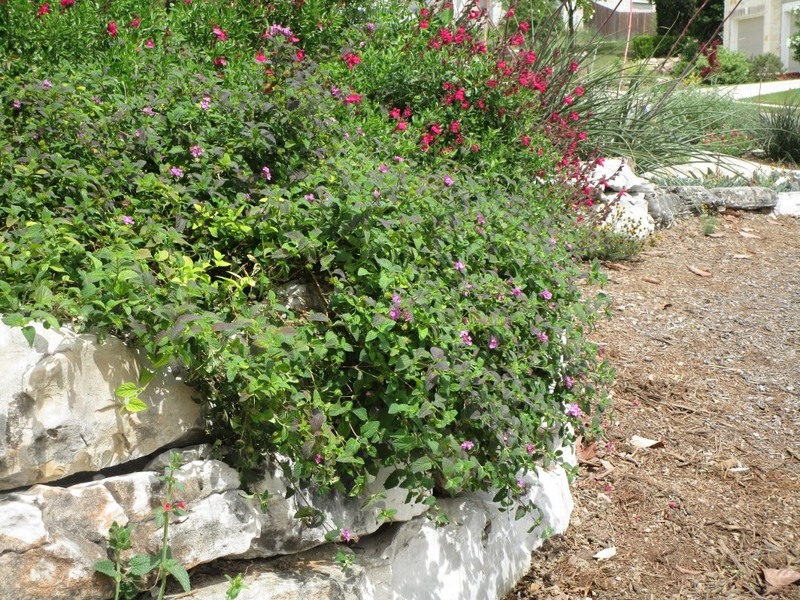 Lantana and salvia soften low stone borders. Linda inspired her neighbors to keep on going up the block by planting their parkway strips. The neighbors down the block are inspired too. An Agave ovatifolia which was already there when Linda and Alan moved in anchors the far corner. 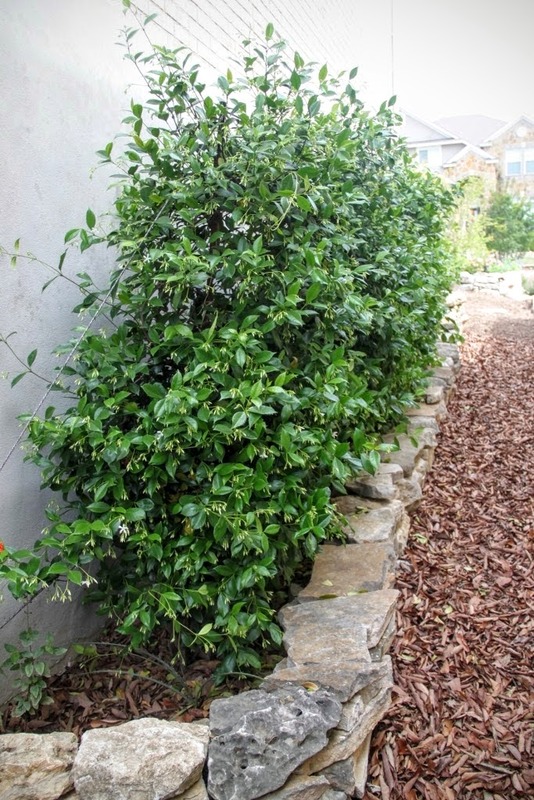 Linda solved the blank concrete wall problem on her deeply sloping lot with a wire trellis of Jasmine. Just inside the back fence we are greeted with a blooming Peggy Martin or Katrina Rose. 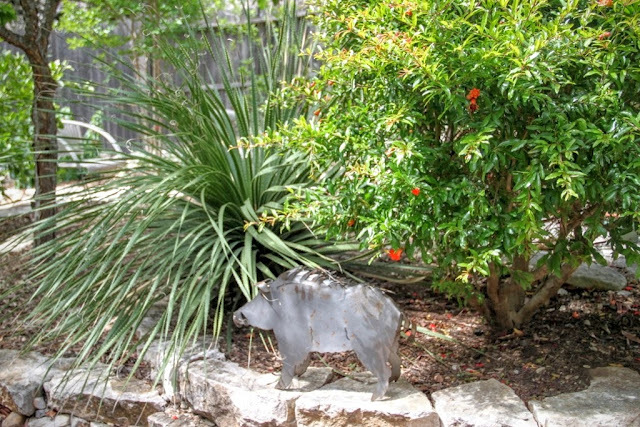 Before we continue our tour of the back yard, here's a look at what they started with in 2007. That's Alan pondering the task ahead. Feel free to scroll back up to this photo as we tour. Below is a similar view taken last week. 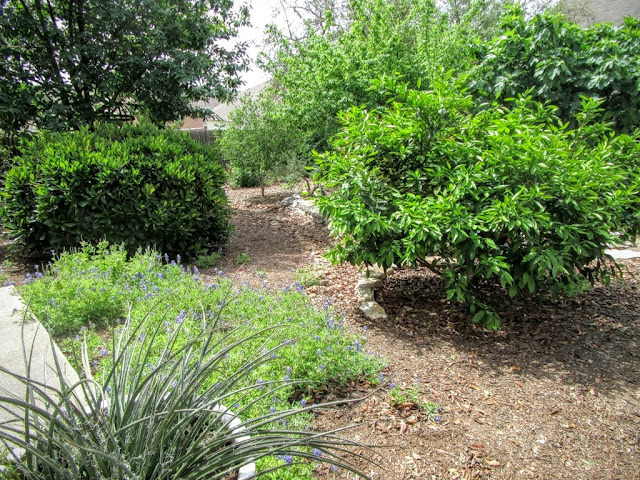 Citrus, Pomegranates, Figs and all manner of wonderful plants. A vine will soon cover the screen in front of that ugly green box and neighboring homes have nearly disappeared. 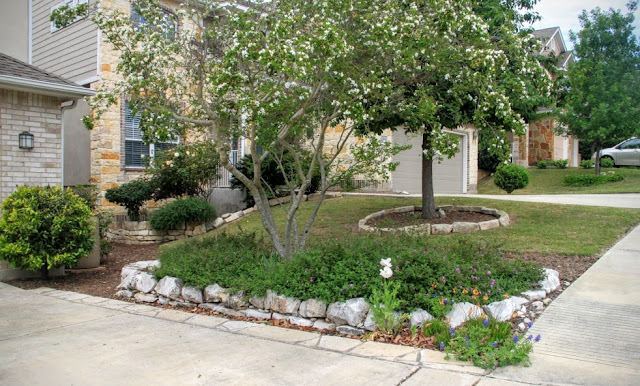 Typical lawn stretching between fence-hugging borders wouldn't provide the same sense of privacy at all. All those rocks from the "Before" photo were put to work defining raised beds and dry creeks. Water in these runoff channels sometimes reach whitecap stage during our legendary rain storms. Getting into the Texas spirit "Javier Javelena" guards a Dasylerion wheeleri and blooming Pomegranate. 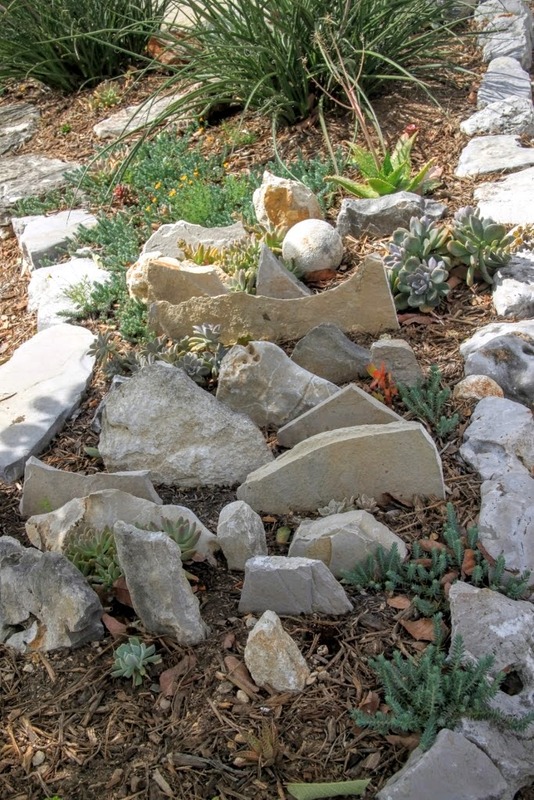 A rarely used firepit became a gravel garden over time. 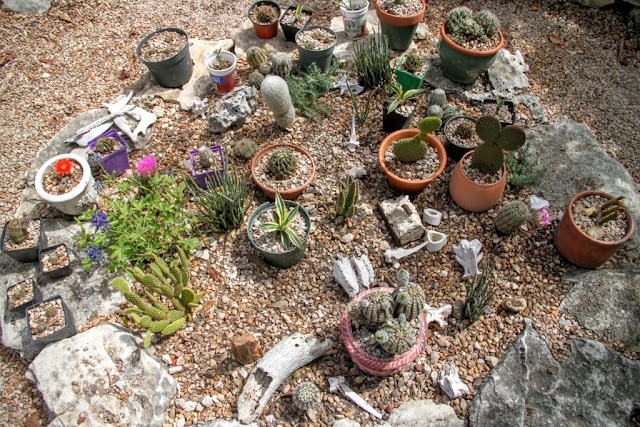 Some of these plants were collected on hikes in West Texas. 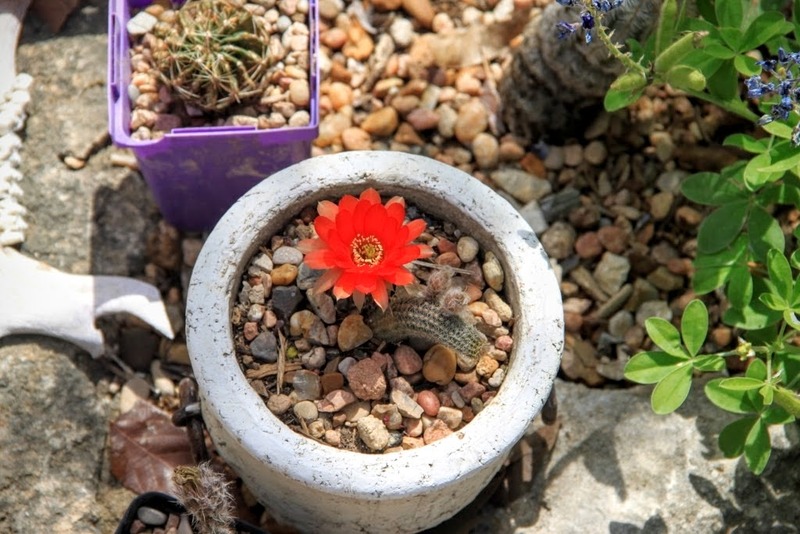 Linda has become a fan of the desert and its plants since moving to Texas. 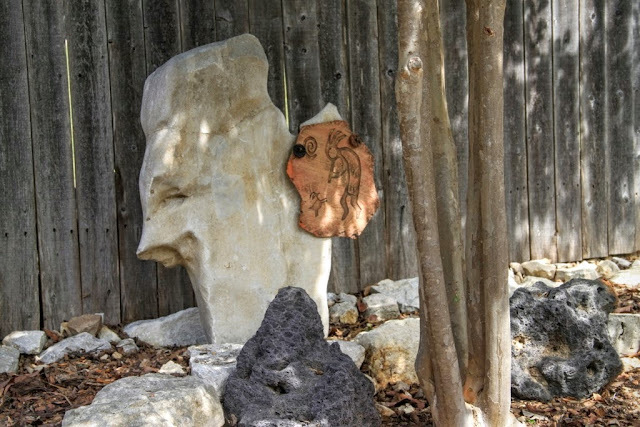 Originally a "ringing rock", this piece of native limestone lost its ring when it chipped but it still decorates a fence along with Kokopelli. 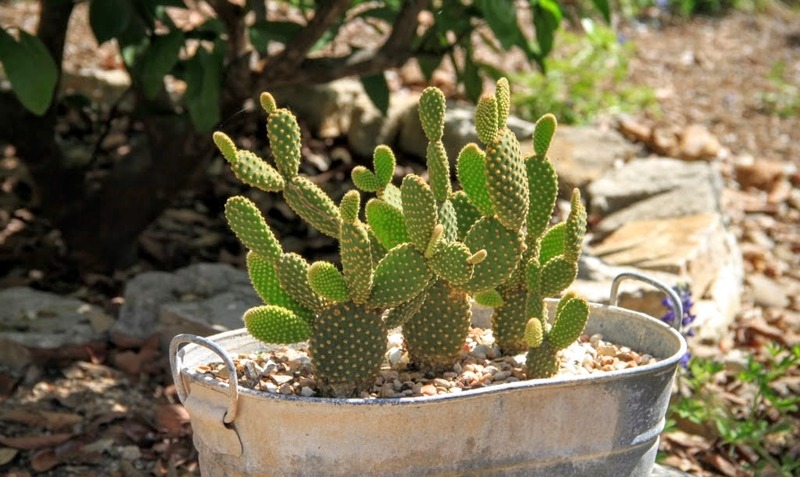 Bunny ears cactus looks cute and bubbly in a tub. 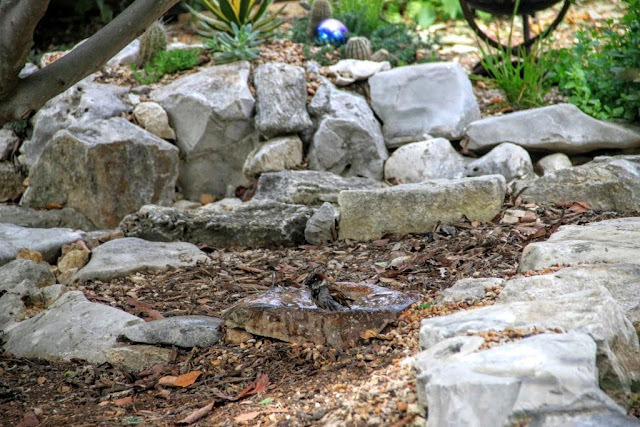 Low water, low maintenance is Linda's goal in her garden which is watered only to get plants established. 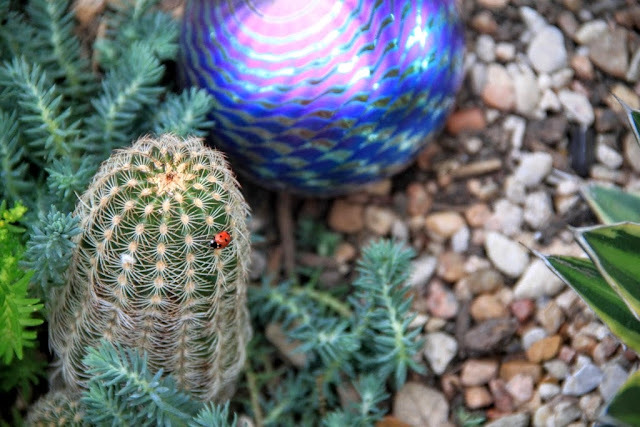 I don't remember a ladybug on a cactus before. Wildlife appreciate special touches for their benefit. Alan's favorite view from the side gate. 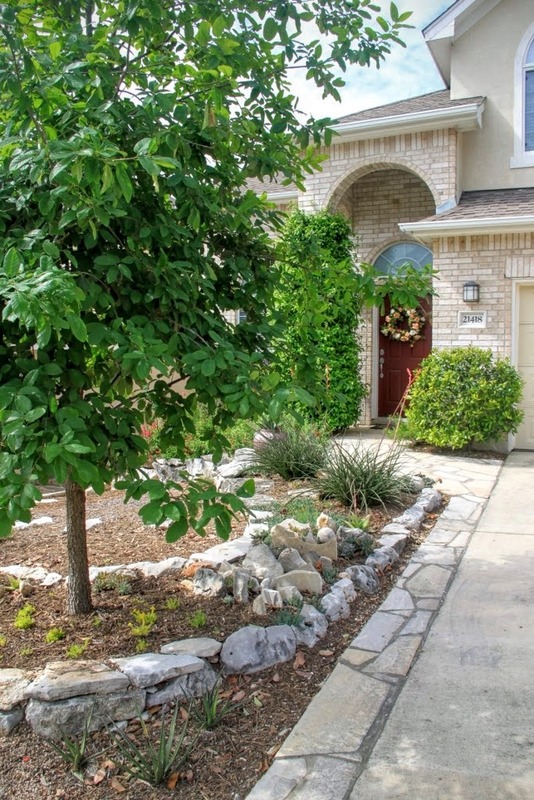 Lush, no lawn garden with bluebonnets and fruit trees. 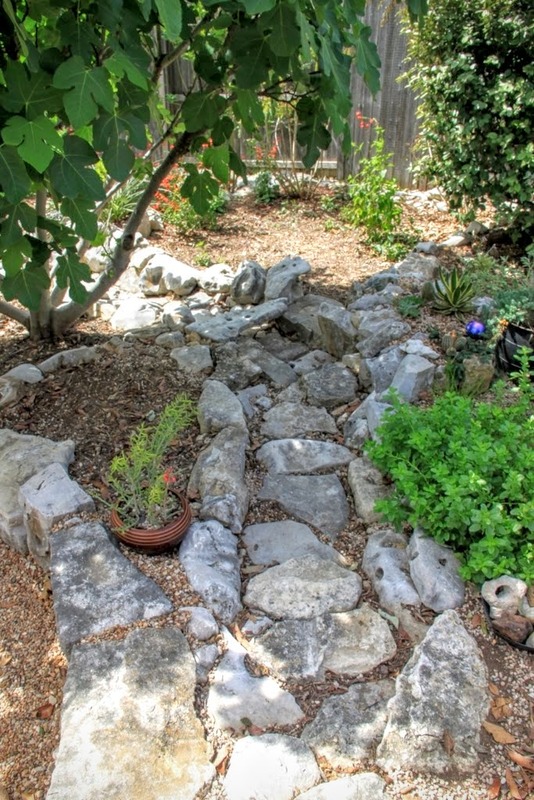 Instead of gravel, they use mulch and allow fallen leaves to compost in place. 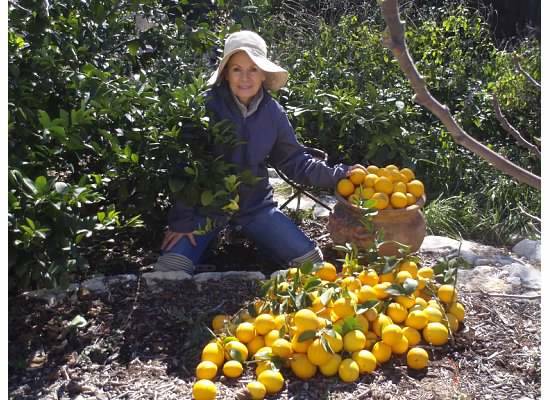 Linda with her bounty of Meyer Lemons which she gives as gifts to family and friends when she visits New York in winter. Linda is planning to open her garden for a future Watersaver Landscape Tour. Since we live in the same part of town, she's convinced me to open my garden on the same day. We're not committing to a date yet, but stay tuned. Thank you Linda and Alan for a fun tour of your garden! 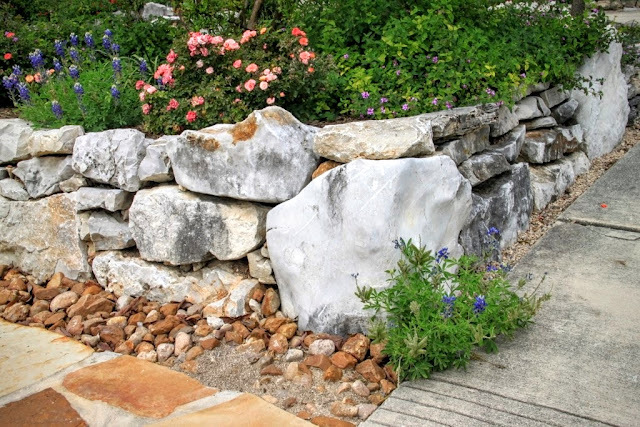 The planting is a lovely mix of softer foliage and more structural forms - super foils for the stones. What a transformation since 2007! They appear to have moved mountains! Great news that you will both be opening your gardens - I look forward to reading all about it! The work seems daunting to me now but I'm still working toward that goal. I'm so envious of all that natural stone. 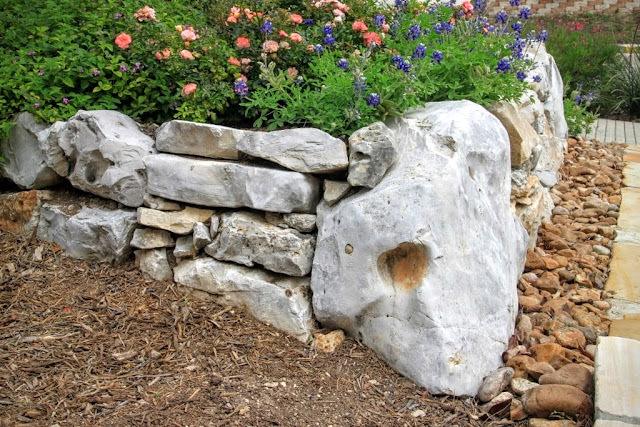 They've used it to great effect in making defining structures to set off the plants. Wish I could see it in person. A bit too far away. There are many days I wish we didn't have so much natural stone but mostly it helps a lot when we need to build raised reds. It's always good to see hard work paying off. An impressive amount of thought and work has gone into that garden. My first reaction upon seeing the pile of rock in the back garden was envy at having a supply like that to work with but then I remembered how heavy each stone must have been. Those stones are heavy and we generally try to roll them into place when lifting gets to be too much. are SO much more interesting than a silly patch of lawn. 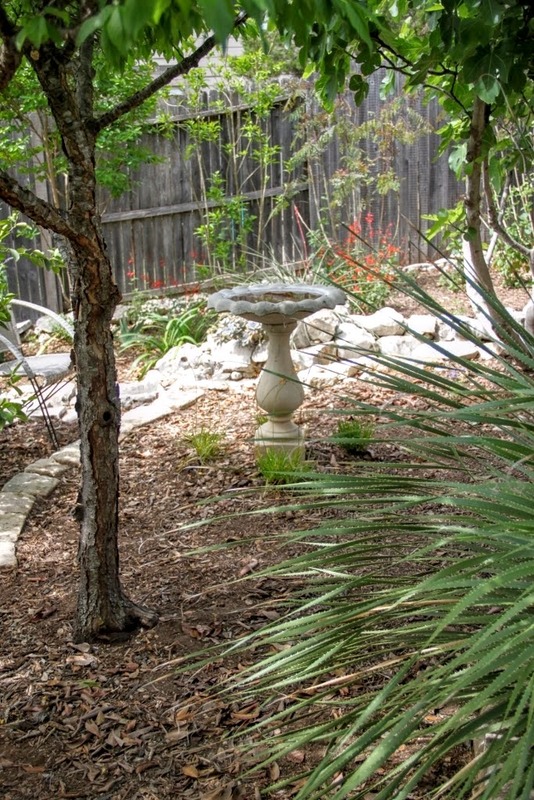 Lawn is especially silly where we have limited rainfall and a wealth of dry-loving native plants! Such an improvement over time! Thanks for showing the before and after, and for sharing this tour of your friend's garden. It's incredible! It really is, I hope I conveyed what it a pleasure it was to visit this garden. very creative & bountiful (oh, those lemons!) & such an amazing result from that daunting slope & mountain of rocks! my back & knees are twinge-ing sympathetically: SO IMPRESSIVE! Definitely impressive and so enjoyable to visit. 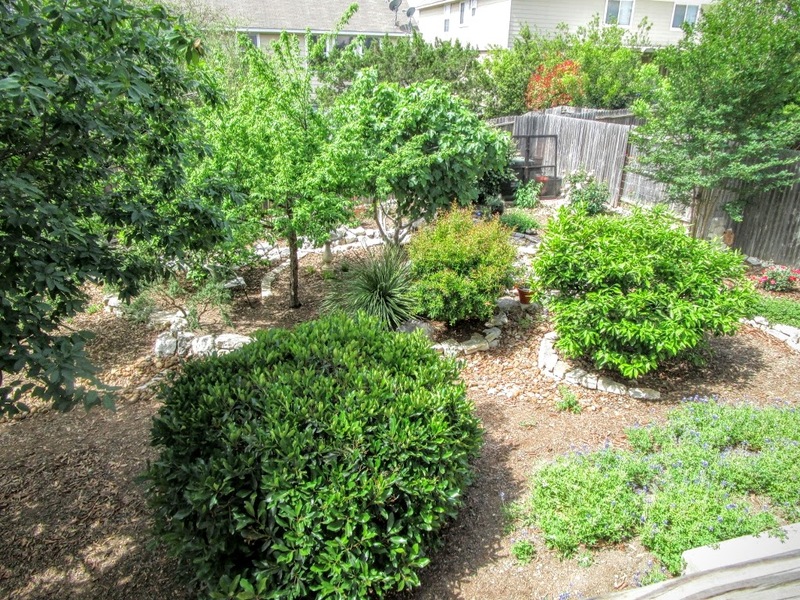 I am a fan of no-lawn gardening, I had it in my previous garden and now here in my new garden. Lovely to see your friends’ garden and see the development from early start – and so many inspirational design ideas! 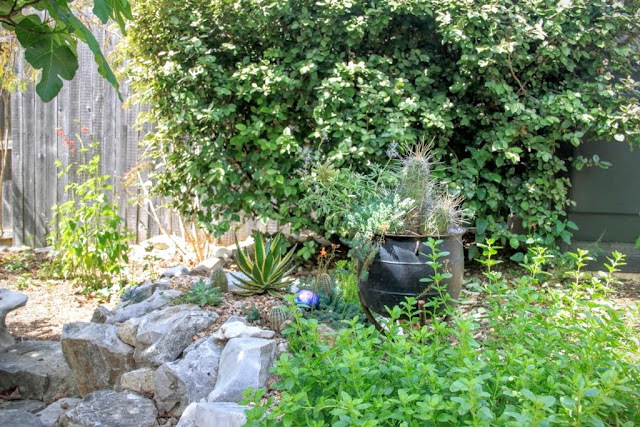 It makes so much sense, especially in a smaller yard to fill it with plants you enjoy. They are too hard working people, well done! I like the front garden, it's very pretty, Shirley. Their work paid off with the wonderful environment they achieved. What an incredible transformation to go from virtually zero bones to that! Awesome awesome awesome... I absolutely love it!!!!! I'm guessing that's a likely "yes" from the tour committee when she's ready to open her garden. Thank you for taking me to a wonderful garden. Very interesting to see home garden around your area. I Like how to use the rocks and stones. Very creative garden!! 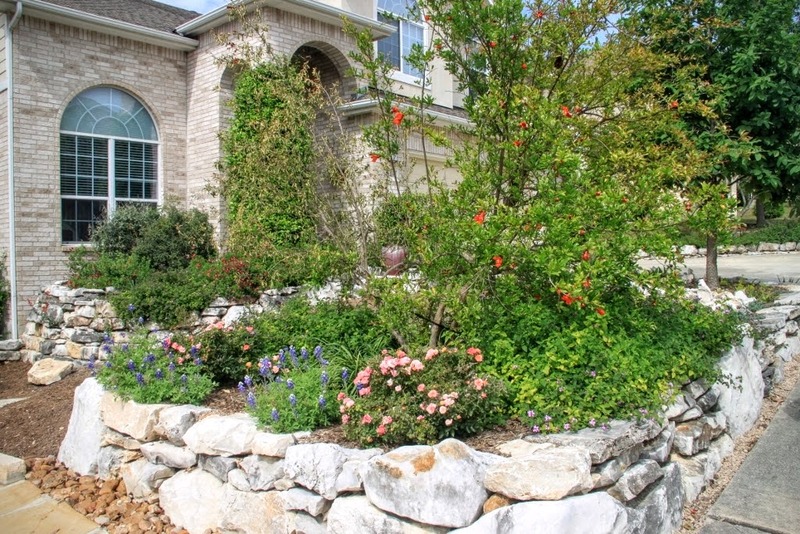 They did a great job with their gardens. 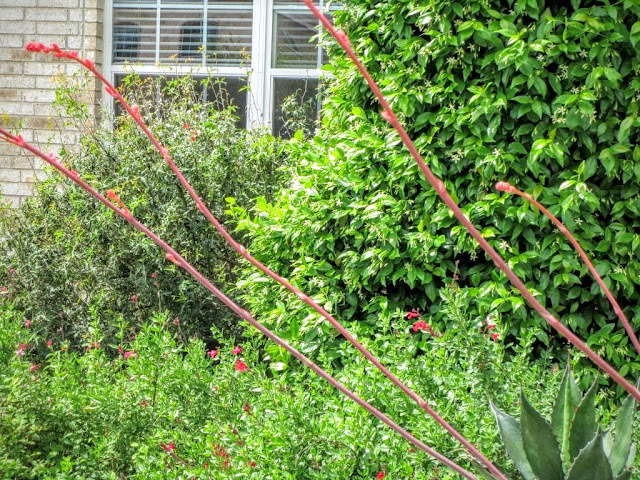 It is fun to see gardens from all over. 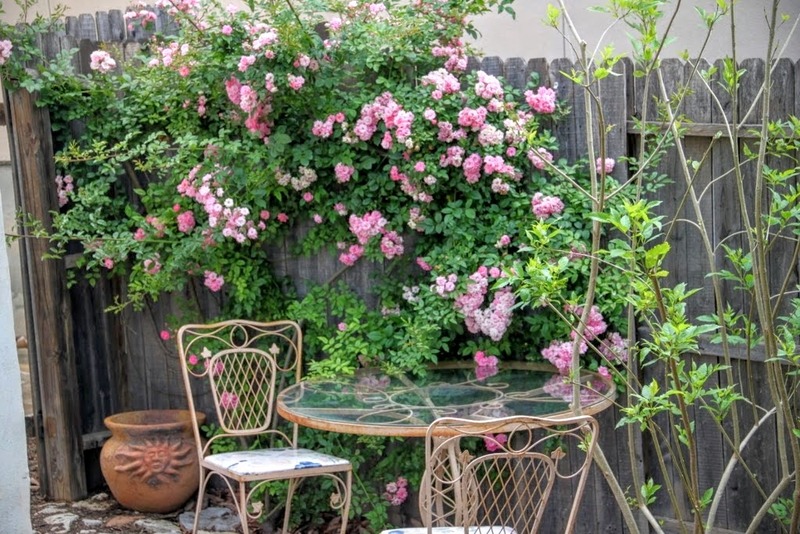 It's great to see Linda's lovely garden, especially with "before" pics to compare it with. 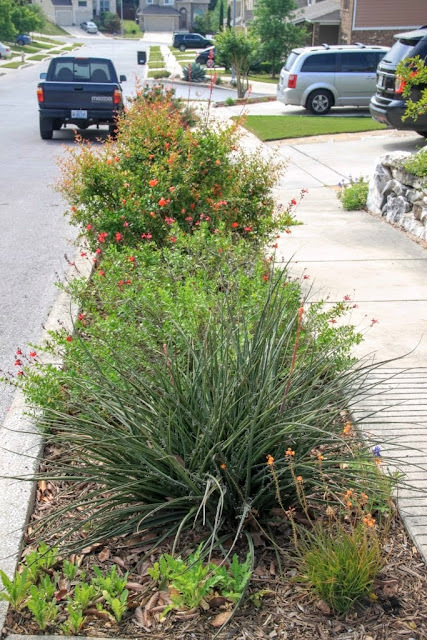 I agree, a mix of fruit trees and tough shrubs and perennials is infinitely preferable to boring lawn, and it gives back in terms of privacy, edibles, and wildlife habitat. I'm so glad they had those photos to share, it does make such a difference. Such a pretty garden!! I love all the variety. There is so much variety and it still all works together beautifully. Amazing garden. It looks so unique with stones and unusual plants. Your friends are really creative. 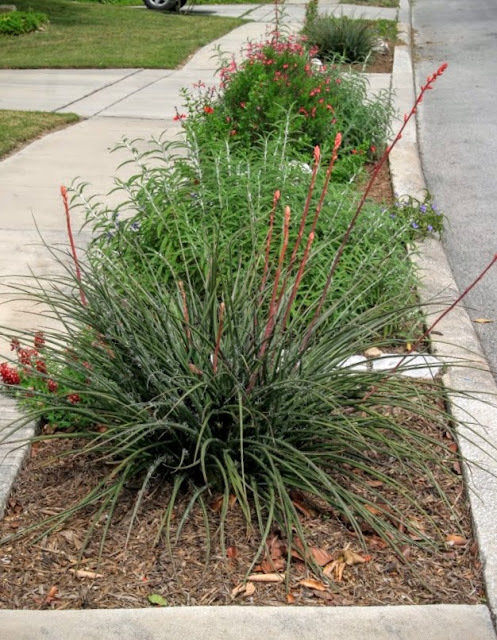 So different from the typical lawn and foundation shrub combination we often see. It would be a good one for your list.